In my younger days I somehow got into the unusual world of professional wrestling. More than how it operated as a sport, I guess I bought into the narrative that it tried to sell such as how the Undertaker would keep coming back from the "dead" or the unusual squabbles and betrayals of the Hart family. Wrestling was more than just what happened within the ring but more the narrative that they built up among the characters. GLOW is the celebration of the Gorgeous Ladies of Wrestling, a women-only wrestling variety show that aired in the 80's. I can't claim to have seen the original show myself but the promise of a fictionalized comedy series for a show of this nature certainly had me curious. Plus who wouldn't want to buy into some over the top caricature of already outlandish characters? The final result was a show that was part docu-series, part comedy and all heart more than anything else. It turned out to be a show that I enjoyed a lot more than even I had expected and I have no regrets getting into the show. 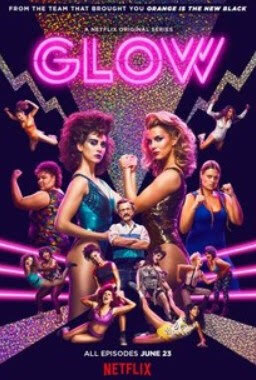 Synopsis: GLOW is an American comedy television series created by Liz Flaive and Carly Mensch for Netflix. The show is based on the 1980's syndicated women's professional wrestling television series created by David McLane. The initial focus of the series is Ruth Wilder (Alison Brie), a struggling actress who can't seem to get a break. She manages to find herself at an odd audition for a women's professional wrestling TV series even though most of the people who show up at the audition have no wrestling or even athletic experience at times. She initially doesn't make the cut for director Sam Sylvia (Marc Maron), but when she manages to try again at the same time she is confronted by her best friend and fellow actress Debbie (Betty Gilpin) about her having an affair with her husband. The resulting fight sets the stage for Ruth getting a second chance but there's a longer process for them figuring out their respective "characters" for the show while being trained in various wrestling moves or even just learning how to fall without hurting themselves. Bit by bit we watch the girls become the larger than life ladies of wrestling, provided this show ever gets off the ground. What I Liked: While things seem to start a little slow, things go crazy once they start figuring out their characters and the possible stories. Alison Brie is an amazing comedy actress and her commitment to the role and the performance she gives is truly memorable. But the same goes for many of the girls in the cast with stand out performances by the likes of Carmen / Machu Pichu (Britney Young) and the intense Sheila the She Wolf (Gayle Rankin). 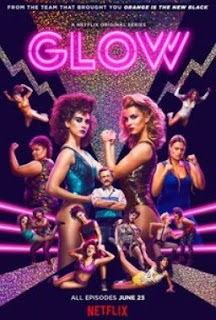 The overall story, which I assume is a blending of fact and fiction based on different accounts of various women who actually participated in the original GLOW resulted in a great narrative journey. They found a way to have a longer arc for Ruth and many of the other characters while trying it all together with the steady progression of the show coming together and all of them learning how to actually wrestle. It's a unique experience that I enjoyed thoroughly. What Could Have Been Better: The show starts a little rough with a lot of silent scenes and awkward moments. And Marc Maron's initial performance is pretty creepy (which was probably intentional) and hard to enjoy versus the earnest efforts of the girl to try as hard as they can. Things sort of get better once Bash (Chris Lowell) takes on a bigger role in the show and later the official announcer of GLOW but that takes a bit of time. And this is not a ha-ha-ha sort of comedy series. It's more the sort that features situations of some amusement or awkwardness or things that get the wheels in your head turning but not necessarily laughing out loud. I guess it depends on the person and your sense of humor but I can respect that not everyone will "get it" nor will they consistently enjoy things as the show still has first season growing pains as it figures out its voice and where things work and where they don't. TL;DR: GLOW is a special entertainment experience that manages to celebrate the original show but in a new way. I love the talent gathered for this show and the story that drives it forward - it's totally worth giving a chance. Thus the show gets a good 4 surprise wrestling moves the girls try out of a possible 5.